Like most people, you’ve probably made resolutions in the past that went unfulfilled. It’s easy to give up on making resolutions because you’ve convinced yourself you just can’t change. Don’t be too hard on yourself. Here are some tips to make realistic New Year’s resolutions for your lifestyle and great tips on keeping them up throughout the New Year. Find a place where you can sit and reflect. Have a pen and paper available, or a tablet device if preferred. What can I do to improve my health? Avoid unhealthy food? Avoid all fast food? Fried foods? Red meat? Eat fish twice a week? How about more fiber, beans, whole grains? Go to the gym? How often? Maybe start off going once a week but increase by one day each month for the next few months. What can I do to be a better parent? Can you attend a sporting event or other activity each week? Can you proofread papers or help with homework? Can you take your kids on an educational trip over the summer? Can you take a weekend and see a historical location or museum? You don’t have to travel far; it could just be a day trip. What can I do to be a better friend? Make a list of everyone’s birthday and address to send cards. Contact or visit a friend you haven’t seen in years. Are there “friends” you need to get rid of? Are they unhealthy or negative? What can I do to be more successful at work? Can you keep your files and desk more organized? Get up 20 minutes earlier to get to work on time? What can I do to be happier at work? Learn to say no to the procrastinators. Don’t skip lunch no matter how busy you are. Take your vacation days instead of putting the company first. Get some exercise or be involved in networking during lunchtime. What can I do to improve the world? Change the light bulbs in the house to the energy efficient bulbs. Choose a hybrid or high-mileage car. How do I get the best gas mileage you can out of the car you have? How can I reduce waste? Are you recycling as much as you can? How can I become an activist? Look over your list and see what items on it are most important to you. Don’t take too long choosing; often it’s the things that leap out at you straight away that have the most meaning for you personally. Don’t just address the big battles. Think of the smaller habits that turn into big problems when not addressed. Indeed, it is often smaller, more discreet resolutions that are most effective and that can be built upon to reach bigger overall goals. Try to be realistic and adjust any goals that may be too hard to tackle. Break down larger goals into smaller actions. For example: Instead of resolving to lose 30 pounds in the following year, you can resolve to cut out fast food, soft drinks, sugary snacks and drinks, drink more water, and walk three days a week until March, and then gradually add in two days at the gym. Before you know it, your 30 pounds will be gone, almost as if by stealth. Instead of having the 30 pounds goal looming over your head, you can chip away at it by achieving your smaller resolutions. In the long run you’ll be much healthier and much more likely to maintain the weight loss as you’ve formed a new lifestyle pattern instead of a deprivation regime. Make your list of resolutions. Don’t make a short list of huge goals. Make a list with many smaller goals. If you need to put down 20 resolutions, go for it! Sit down with your family and friends and discuss your goals and why you made them. Ask for their support on these goals throughout the year. If possible, team up and visit the gym or shop at the health food store together. Ask them to speak up if you slip and order a Diet Coke instead of a water, or forget another goal on your list. 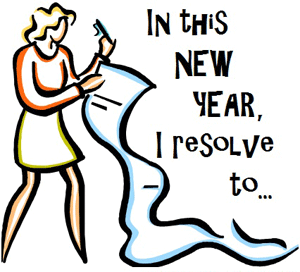 Print or write out copies of your resolutions. Save a copy on each computer or electronic device you own, such as your cell phone, tablet, eReader or MP3 player (if it accepts notes). Email a copy to your work address. Make a smaller copy and keep it in your wallet. Post a copy on the outside of your refrigerator! Use bright paper so it catches your eye and don’t let it get hidden behind coupons and artwork. If possible, post a copy up at the office or your place of business. Consider sharing your list with an office friend. You’ll have that support system everywhere you go. Congratulations! Your resolutions have been made. Keep checking back to your list daily to keep your eye on the ball. Don’t be afraid to add new goals throughout the year. Keep at it. The best goals in the world will do no good if you don’t follow through with consistent actions.